The team, from left, Jean-Fancois Therrien, Marc Bechard, Jennie Duberstein & Keith Bildstein. I have just returned from field work on the northernmost population of North America’s southernmost race of turkey vultures, Cathartes aura aura, a diminutive and largely tropical sub-species that weighs only two-thirds as much as other North American turkey vultures. 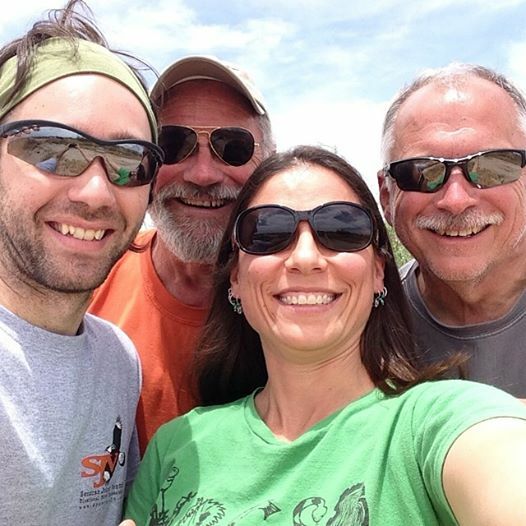 Our field team was made up of Hawk Mountain Research Associate Dr. Marc Bechard of Boise State University, former Sanctuary trainee Dr. Jennie Duberstein of the U.S. Fish and wildlife Service, me, and Hawk Mountain’s Senior Research Biologist Dr. Jean-Francois Therrien. 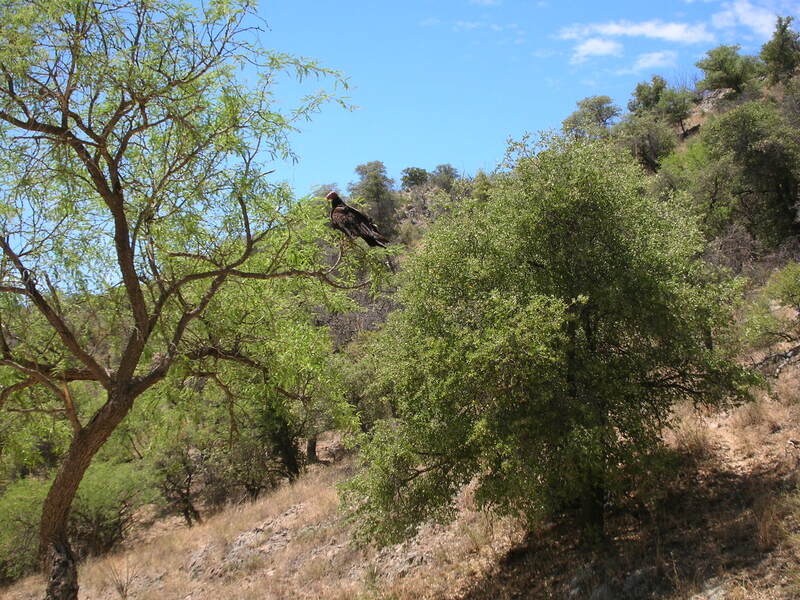 Our work in the approximately 100,00-square-mile Sonoran Desert in southern Arizona which included placing satellite tags on both turkey vultures and black vultures, turned out to be—as often is true of field work–full of surprises. Our new trapping site at a pair of dairy farms on the outskirts of Buckeye, Arizona, southwest of Phoenix, was far better managed than many of the farms we had visited before, and its owners were gracious beyond belief. One of the potential trap sites offered little in the way of clear views of any traps we might put out, but a second site near a massive ossuary, or boneyard, proved to be perfect. 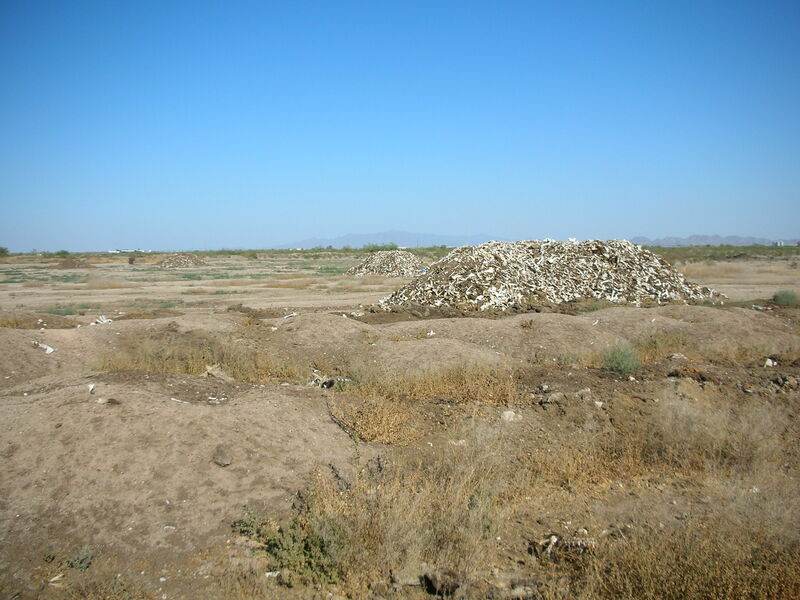 A bone pile provided an ideal trapping site in the Sonoran Desert west of Buckeye, Arizona. Our plan was simply enough to trap and tag six turkey vultures and four black vultures, conduct a few day-long roadside counts, and spend a day looking for several of the individual vultures we had tagged in May 2013. We had nine days to accomplish all of this and, as there was no rain in the forecast, the plan seemed quite reasonable. In the past, our experience with trapping turkey and black vultures has been that the latter species is easier to trap than the former, in part because black vultures dominate turkey vultures at carcasses, and in part because of the black vulture’s more social nature (i.e., if you catch one you are likely to catch many). But not this time around. The first six birds we caught were turkey vultures! Blacks, although relatively common in the area, rarely showed up at our trap site, and were more skittish than the turkeys. We did catch one on the sixth day of trapping, but decided to turn to road surveys on the seventh day, as the likelihood of trapping more black vultures seemed rather low. Presumably most black’s in the area were feeding somewhere else, and unfortunately, we never found that location. A perched turkey vulture along one of our survey routes near the ghost town of Ruby, Arizona. We spent the next two days counting vultures along two road-survey routes that covered more than 300 miles of Arizona secondary roads south of Gila Bend and Tucson Arizona, mainly in the Tohono O’odham Indian Reservation and the Coronado National Forest. Unlike the counts we conducted in January, the routes were filled with single and small groups of turkey vultures, many of which appeared to be searching the roadways for road-killed carrion, including snakes. Overall, we saw more than 10 times as many birds as we had seen along the same routes in winter, suggesting that the bulk of the population migrates south from the region in winter. We spent the final day in the field searching for the five vultures we had tagged last May. The first one we searched for was “Jennie,” a vulture that, having migrated about 250 miles into Mexico last October, returned to Arizona less than a week later and overwintered in the area south and west of Gila Bend. Unfortunately, Jennie was roosting in the Barry M. Goldwater Air Force Range, a bombing range south of Gila Bend that was off bounds for us, and was feeding at a dairy farm west of Gila Bend that the owners would not allow us to enter. The next three birds were roosting and hunting closer to Maricopa Arizona and we set out in search of them just before noon. The last known location of the next bird, “Desert Rat,” took us to a roosting site in a nut grove across the street from a large dairy farm. Although we did not actually see the bird, we did find a number of molted feathers under a nut tree, confirming the presence of vultures at the site. 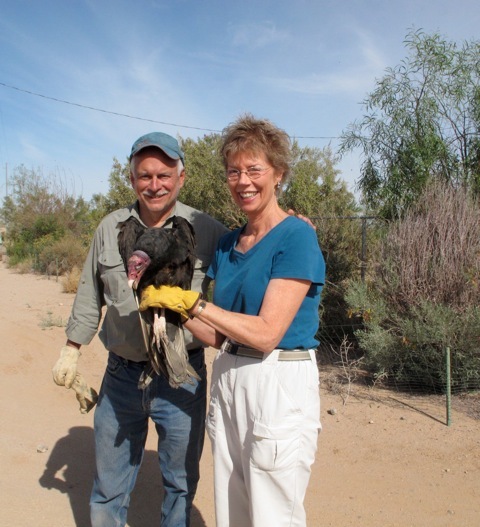 Keith and Linda Wallace-Gray with her vulture namesake in May 2013. The next bird we looked for was “Julie,” who had last been sighted over a recently cut north of Stanfield, Arizona. Although we failed to see Julie, we did see another tagged vulture, “Linda” feeding together with six other birds on a road-killed jackrabbit at the edge of the hay field. Linda’s transmitter had been “misbehaving” and was sending signals episodically, with the last fix being recorded more than a month earlier in early April. She was close to where she was then, and our sighting of her helped explain the episodic nature of her signals. Although her tracking device was still in place on her back, the antenna for it was missing, a fact that almost certainly explained the spotty nature of her signals. Given that we had seen close to 100 birds the day we were searching for the tagged individuals, and that as many as 500 birds almost certainly were using the area, our visual sighting of Linda, albeit without her antenna, was like winning the lottery … a “grand finale” of sorts for our field work. Our plans are to revisit Arizona next January, not only to finish our tagging efforts there, but also to conduct additional road surveys. Although we are but one year into our studies of Arizona’s Sonoran Desert vultures, we already have learned much about their ecology. Equally importantly, we also have learned to expect the unexpected in this population, which gives me reason to believe we need considerable additional monitoring to understand this most-southern race of North America’s most common and widespread avian scavenger. So please stay tuned. Kids and I saw a vulture today at the Navajo Bridge at Marble Canyon in AZ. It had a tag “K6” on its wing. Any way to learn its name? They were really curious about it.